Here's a record of this page which was taken down to allow for software updates. This may be useful if you're using an older release from 2017 towards testing RTL-SDR dongle functionality. We need to make clear that this is NOT suitable to be used as a main receiver, just an off-air local monitoring capability within the transmitter. For reception of other stations you should always use a MiniTioune USB receiver. F5OEO had included F4DAV's innovative LeanDVB receiver software within the Transmitter software build, and from software release 201612310 this is included in the core functionality of the Portsdown transmitter. The software is described on page 18 of CQ-TV 252 and at http://www.pabr.org/radio/leandvb/leandvb.en.html and can be configured from the Portsdown transmitter Console Menu. 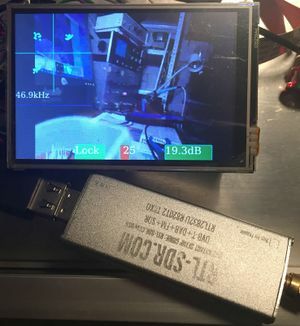 On a Raspberry Pi 3 using an RTL-SDR, it will receive anywhere between 24 – 1766 MHz and decode at up to 1000KS/s and display on the touchscreen LCD. I used an RTL-SDR from http://www.rtl-sdr.com/buy-rtl-sdr-dvb-t-dongles/ but there are cheaper ones available. Waveshare screen displaying video received via the dongle. The software is not as good as MiniTioune at digging signals out of the noise, and sometimes takes a while to lock, but is well worth playing with as a stand-alone test receiver. It uses the same parameters (frequency, SR, FEC) as are set for the Portsdown transmitter, either through the console interface or on the touchscreen. For those of you who want to try to improve it's capability by tweaking the sample rate, the settings can be adjusted in the file /home/pi/rpidatv/scripts/leandvbgui.sh on the Portsdown software build. It is a shell script, so you will just need to restart the receiver to apply the new settings. If you find improvements, please publish them here and I will put them in the core build. This page was last modified on 21 February 2018, at 18:13.